A thick fog clouded the battlefield throughout the day. The vanguard of Sullivan's column, on Germantown Road, launched the battle when they opened fire on the British pickets of light infantry at Mount Airy just as the sun was rising at around 5:00 am. The British pickets resisted American advance and fired their guns in alarm. Howe rode forward, thinking that they were being attacked by foraging or skirmishing parties. 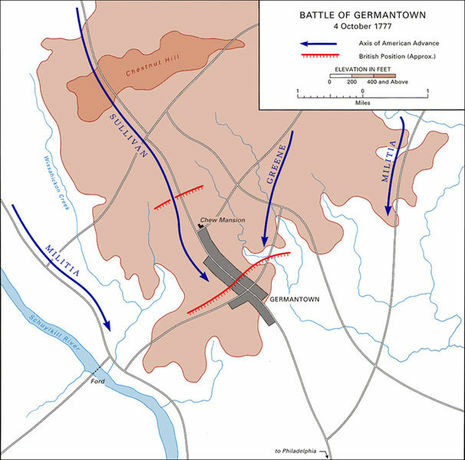 It took a substantial part of Sullivan's division to finally overwhelm the British pickets and drive them back into Germantown. Now cut off from the main British and Hessian force, British Col. Musgrave caused his six companies of troops from the 40th Regiment, around 120 men, to fortify the stone house of Chief Justice Chew, called Cliveden. The Americans launched furious assaults against Cliveden, but the greatly outnumbered defenders beat them back, inflicting heavy casualties. Gen. Washington called a council of war to decide how to deal with the distraction. Some of the officers favored bypassing Cliveden and leaving a regiment behind to deal with it. However, Brig. Gen. Henry Knox recommended to Washington that it was unwise to allow a garrison in the rear of a forward advance to remain under enemy control. Washington concurred. Gen. William Maxwell's brigade, which had been held in the reserve of the American forces, was brought forward to storm Cliveden, while Knox, who was Washington's artillery commander, positioned four three pounders out of musket range and fired shots against the mansion. However, the thick walls of Cliveden withstood the bombardments. Infantry assaults launched against the mansion were cut down, causing heavy casualties. The few Americans who managed to get inside were shot or bayoneted. It was becoming clear that Cliveden was not going to be taken easily. Meanwhile, Gen. Nathanael Greene's column on Limekiln Road caught up with the American forces at Germantown. Its vanguard engaged the British pickets at Luken's Mill and drove them off after a savage skirmish. Adding to the heavy fog that already obscured the Americans' view of the enemy was the smoke from cannons and muskets, and Greene's column was thrown into disarray and confusion. One of Greene's brigades, under the command of Gen. Stephen, veered off course and began following Meetinghouse Road instead of rendezvousing at Market Square with the rest of Greene's forces. The wayward brigade collided with the rest of American Gen. Wayne's brigade and mistook them for the redcoats. The two American brigades opened heavy fire on each other, became badly disorganized, and fled. The withdrawal of Wayne's brigade left Conway's left flank unsupported. In the north, an American column led by McDougall came under attack by the Tory Loyalist troops of the Queen's Rangers and the Guards of the British reserve. After a savage battle between the two, McDougall's brigade was forced to retreat, suffering heavy losses. Still convinced, however, that they could win, the Colonial 9th Virginian troops of Greene's column launched a savage attack on the British and Hessian line as planned, managing to break through and capturing a number of prisoners. However, they were soon surrounded by two British brigades who launched a devastating counter charge, led by Gen. Cornwallis. Cut off completely, the 9th Virginian Regiment was forced to surrender. Greene, upon learning of the main army's defeat and withdrawal, realized that he stood alone against the whole British and Hessian force, so he withdrew as well. The large, main attacks on the British and Hessian camp had been repulsed with heavy casualties. Washington ordered Armstrong and Smallwood's men to withdraw. Maxwell's brigade, still having failed to capture the Chew House, was forced to fall back. Part of the British army rushed forward and routed retreating Americans, pursuing them for some nine miles before giving up the chase in the face of resistance from Greene's infantry, Wayne's artillery guns and a detachment of dragoons, as well as the nightfall. Lt. Gen. William Howe was camped outside of Philadelphia and Gen. George Washington's American forces were looking to drive Howe away from Philadelphia and re-capture it. Washington basically devised a plan to divided his army into 4 groups with each group taking a different path and to have a night march. Hopefully in the early morning his troops would hit Howe's army from 4 different roads all at the same time. This was a brilliant plan if it could be carried out successfully. It would surprise the British on both flanks and in the center and hopefully it would compel the British to retreat from the vicinity Philadelphia and leave it open for the rebel re-capture. The British were camped from along School House Lane and Church Street. The British units from left to right were a division of Hessians under Lt. Gen. Baron William Fnyphause, 2 British support brigades, a division of British regulars under James Grant, a division of the Queens Rangers (Tory units raised in the colonies) and 2 battalions of British Guards. Located near the Chew House was the 14th regiment under Lt. Col. Thomas Musgrave. His job was to support the 2nd Light Infantry Battalion under Capt. Allen Mclane if it came under attack. A half of a mile away was the Logans House, where General Howe's HQ was. For Washington he was going to have the Pennsylvania militia under Gen. John Armstrong hit the British on the left while militia under Col. William Smallwood and David Formann hit the British on the right. In the center would be Washington's best troops, Brig. Gen. Anthony Wayne and Sullvian's Division. Between these troops and the militia to the left would be 4 brigades all under Maj. Gen. Nathanel Greene which was Washington's largest prong. Some of the retreating British troops take cover in the Chew House. Henry Knox tries to bombard the house, but to little affect. Next, Maxwell orders his troops to take the house by storming it. Thirty minutes and 50 dead later, Washington calls the attack off and has the house cordoned off. The delay of 30 minutes cost Washington the surprise in his attack. While Sullvian's troops are engaged with the Hessians and Wayne's troops are engaged with the James Grant Division, Greene's men after an hours delay show up and drive toward Church Street. Greene's troops attacked the Queens Rangers and the 2 British Battalions with 2 of his 4 brigades. One of his brigades under, Maj. Gen. Alexander Mcdougall's inexplicably never advanced. This blunder caused both Brig. Gen. Peter Mulenberg and Brig Gen. George Weeden to be flanked by British troops. The Militia under John Armstrong to the left side of the battle fought elements of the Hessian troops throughout the entire battle. Also, 2 militia units under David Forman and William Smallwood never even showed up. This , in turn, caused Greene's troops to be without reinforcements. During all this fighting Greene's fourth and last brigade shows up under the now drunk Brig. Gen. Adam Stephen. This brigade after being separated from the rest of Greene's forces by a night march, wanders all across the battlefield towards the sound of the fight. His men then proceed to mistakenly fire into the back of Wayne's troops. Adam Stephen's blunder of firing into the back of Wayne's troops convinced Wayne and his men that they were surrounded so they naturally decided to extract themselves from the fight in order to prevent his unit to be routed and captured. Sullivan seeing his right flank fall back decided to do the same and soon a general retreat followed. This didn't go as planned because at the same time the British after hearing an American call for ammunition decided now was the time to charge. The British charged the American lines and routed them. During the rout, the 9th Virginia in Greene's division found themselves to be surrounded by British troops, so they surrendered in mass. The Americans finally re-organized themselves at Pennypacker's Mill. The battle lasted almost 3 hours. During this time, the battle proved that Americans could stand up and fight against the British. Also, it provided a morale boost because of the near win. Plus, it got the French to think about helping the American cause. Of course, their help would prove to be immeasurable at the Battle of Yorktown. Washington blamed the lost battle, literally all on the fog-of-war. Although the fog was a roadblock in Washington's plans several other factors contributed to the failure. The drunkenness of Stephen who, at the climax of the fight, fired into his own troops. The militia not showing up or providing very little support to the continentals. The delays, especially the delay at the Chew House, which cost Washington the surprise and the hour delay for Greene which enabled the British to prepare for an attack. Also, the shortage of ammo was a crucial factor in the battle and, to some extent, Washington himself can be blamed because of the complexity of his plan involving a night march with untrained troops, especially the militia. In his report to Congress, Washington blamed the fog and the Chew House "annoyance" for the collapse. Stephen was court martialed, found guilty of drunkenness, and dismissed from the army. Greene's unfortunate tardiness was perhaps the biggest factor in blunting the attack. It may be that Washington's strategy was too sophisticated for field officers who lacked tactical experience; and, there were many new, raw soldiers among both the Continentals and the militia. What snatched victory from Washington's grasp were these imponderables. 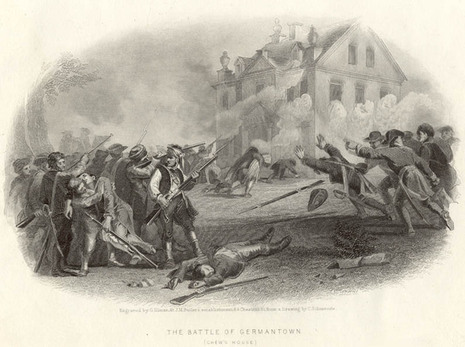 The Americans believed they had nearly succeeded at Germantown, and this lifted morale, despite losses. Howe reported 537 killed and wounded and 14 captured. He recognized, after his narrow victory, that he could not string out his troops as he had done without courting attack. A few weeks later, he evacuated Germantown and reestablished his troops in a line of forts north of Philadelphia.